Built during the reign of Ptolemy II (Egypt’s Greco-Roman Period), the Temple of Isis at Philae is dedicated to Isis, Osiris, and Horus. The temple walls contain scenes from Egyptian mythology of Isis bringing Osiris back to life, giving birth to Horus, and mummifying Osiris after his death. From early times the island was sacred to the goddess Isis. The complex of structures of the Temple of Isis was completed by Ptolemy II Philadelphus (reigned 285–246 BCE) and his successor, Ptolemy III Euergetes (reigned 246–221 BCE). Its decorations, dating from the period of the later Ptolemies and of the Roman emperors Augustus and Tiberius (27 BCE-37 CE) were never completed. The Roman emperor Hadrian (reigned 117-138 CE) added a gate west of the complex. Other small temples or shrines dedicated to Egyptian deities include a temple to Imhotep, one to Hathor, and chapels to Osiris, Horus, and Nephthys. The obelisks in front of the temple were removed in 1918 by British Consul Henry Salt and his assistant Giovanni Belzoni, and are now in a garden in Dorset, England. 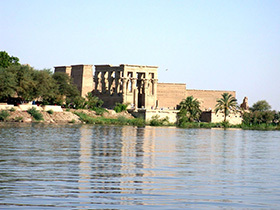 The temple was in danger of being submerged forever with the construction of the new Aswan dam (1960-1970), which flooded the area. Fortunately, the Egyptian government and UNESCO worked together to pump the area dry and relocate the entire temple, stone by stone (50,000 stones! ), to a nearby island called Agilka, where it stands today. Image: Philae Temple Complex. Taken by the Rosicrucian Egyptian Museum.